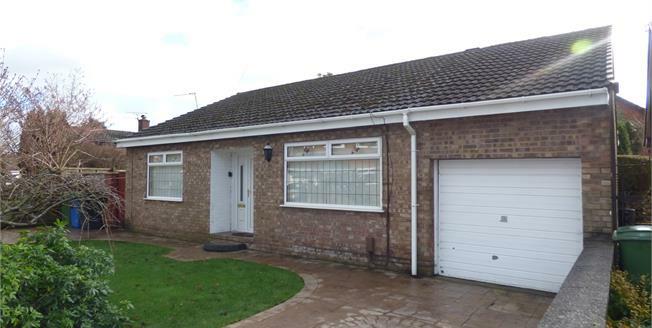 Offered with the advantage of no onward chain is this well sized detached 'true' bungalow which enjoys a private outlook to both the front and rear. The bungalow was originally built with three well sized bedrooms, however the current owner has re-configured the layout and converted the third bedroom into a dining room which now benefits from allowing access to the Victorian style conservatory overlooking the gardens. This could easily be re converted however we feel the integral garage also offers future potential for additional living space should a new owner require therefore its versatility offers plenty of scope for change. The current layout enjoys a large entrance hallway which features open access to the dining room and allowing access to most rooms with exception to the utility room which is located off the farmhouse style kitchen to the rear of the garage. There are two double bedrooms, one of which is located to the front and one to the rear and both benefiting from fitted wardrobes. A wonderful formal living room is generous in size and will offer great appeal to most buyers making it stand out when compared to other styles in the area and the property also has a large four piece bathroom suite making it ideal for a buyer who wishes to retain both bath and shower facilities. Externally there are twin driveways providing plenty off-road parking and are both laid with imprinted concrete. Lawned gardens complement this great home which must be viewed.